Come see Whitney speak during the Opening Ceremony, Thursday, June 13 at 7:00pm! Whitney will also be leading the Dancing for All: NO BS activity sessions on Friday and Saturday morning, as well as a workout class on Friday afternoon! Don’t miss out! 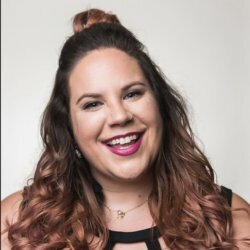 Whitney Way Thore’s viral YouTube video series, A Fat Girl Dancing, thrust her into the spotlight and sparked a global conversation about body image. As a body-positive activist and self-love advocate, she founded the No Body Shame Campaign to help men and women of every variety love and live their lives free of shame. Currently, she stars in the hit TLC reality show My Big Fat Fabulous Life, which showcases her family and friends, her dance career, and her journey to mental, physical, and emotional health. Whitney is committed to initiating positive and sustainable changes in herself and others as well as enjoying every inch of her body and her life along the way. She lives in Greensboro, North Carolina with her cats Henchi, Wanda and Ollie, teaches dance classes specifically designed to build confidence, and hopes that every person on the planet finds their FABULOUS.